Being a strong swimmer doesn't make you drown proof! We recommend that everyone (even if you're an Olympic gold medal champion) wear a life jacket! Every person being towed behind the vessel must wear a lifejacket, at all times. For more information, following this LINK and SAVE THE ONES YOU LOVE! Watercraft without running lights must be off the water by sunset. Summer hours change with Daylight Savings Time. 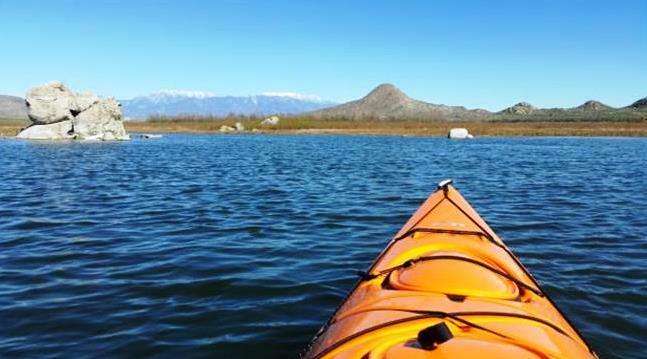 Lake Perris allows power boats, personal watercraft (jet skis), and non-powered vessels (sail boat, canoe, kayak, stand up paddle boards, etc.) on the water. We accept both 2 and 4 stroke engines. 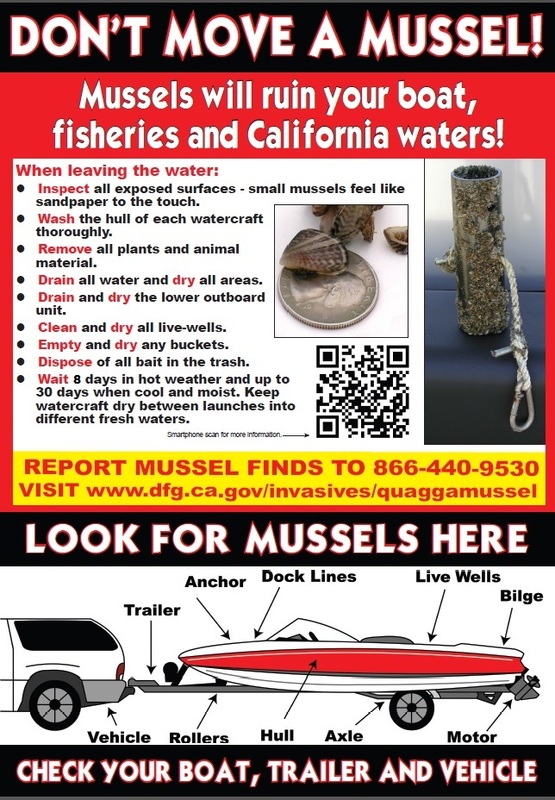 All vessels entering Lake Perris will be inspected for Quagga and Zebra Mussels. This includes all canoes, kayaks, sail boats, rubber rafts, fishing waders, scuba gear, etc. Only boats and equipment which are clean, drained, and completely dry, will pass inspection. If you are coming from a known quagga-infected body of water, you must wait 8 calendar days before bringing it to Lake Perris or Silverwood Lake. Information about Quagga infested lakes, as well as the effects of Quagga Mussels and Inspections. If your boat or equipment, including but not limited to sails, life vests, and skis, are wet, damp, or moist, you will not pass inspection. Failure to pass inspection will result in a full 8 calendar day dry-out period before that failed vessel is allowed to launch at a State Park Reservoir. Multiple watercraft: All vessels on a trailer will be automatically failed if one of the vessels fails inspection. For example, if there are two jet skis on the trailer, and one fails inspection, then the other vessel will be failed as well. Do not wash, rinse, or hose your boat right before coming to Lake Perris. 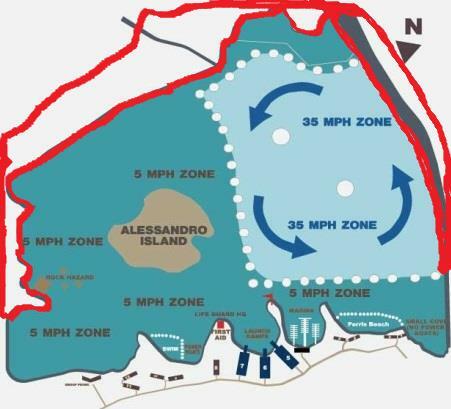 Your watercraft WILL NOT BE ALLOWED IN THE PARK. Let the boat dry for 8 days minimum after washing. The mussel lives in fresh water, so tap water will not remove the mussel from your vessel. These animals are like barnacles, clams, and oysters and they attach themselves to any solid material and thrive in dark, stagnant environments. Rinsing with fresh water will not remove them. To KILL the animal, you must let your boat and equipment in or on the boat be completely dry. Unfortunately there is no easy way for anyone to identify if a damp boat is infested with the mussels. All watercraft must go through inspection before they are allowed to enter the park. We want you to pass inspection, but we all have a responsibility to protect California’s waterways, drinking water supplies, and your watercraft from these destructive, invasive mussels. Watercraft reservations are recommended for summer weekends (Saturday and Sunday) and major summer holidays. In the event of sell-out, only watercraft with reservations will be allowed into the park. Reservations are generally not needed on weekdays and in the off season (between Memorial Day and Labor Day). Reservations are required for each individual watercraft. Each reservation holds 1 space on the water. You will pay Vehicle and Boat Use fees on arrival. Friday arrivals do not generally need a reservation unless Friday itself is a major Holiday. Reservations can be made at www.reservecalifornia.com or by calling 1-800-444-7275 (TDD: 1-800-274-7275). Sail boats, kayaks, canoes, and other hand launch vessels do not need a reservation. CLICK HERE for prices and information, or call (951) 657-2179. Boat Rentals, Watercraft rentals, Wet and Dry Storage. Boat slip holders must purchase a California State Park Annual Day Use or Golden Poppy pass and a Boat Use pass, to enter in and out of the park with their vehicle and/or watercraft, otherwise they will be charged Day and Boat Use fees each day they enter the park. Boat slip holders are allowed to enter the park during boat and day use closures, even without a reservation. The area marked in red is CLOSED due to construction. NO SHORE ACCESS. NO VESSELS ON BEACH OR PEDESTRIAN ACCESS.